Part 1: 2 long buckled band for holding rings. Part 2: 1 buckled panel with up to 40 holes for organizing earrings or brooches. Part 3: 5 buckled bands with an elastic strap and an elasticated pouch below for holding necklaces. Part 4: 1 roomy sided zippered pocket for storing valuables. Part 5: 1 detachable interlayer for storing gadgets like brooches, pendants or other small ornaments; A larger pouches for storing watches or hairpins. Double-zipper design guarantees fast access to your jewelry. If you are tired of unfastening the knotted necklaces, or rummaging around for your earrings and rings, it is time you employ a helping hand. Becko's jewelry organizer can effortlessly and effectively help to solve your trouble, saving you from the unwanted trifles. Whenever going out for a holiday, party or date, you can employ Becko's jewelry organizer as your best helping hand to hold all your essentials. 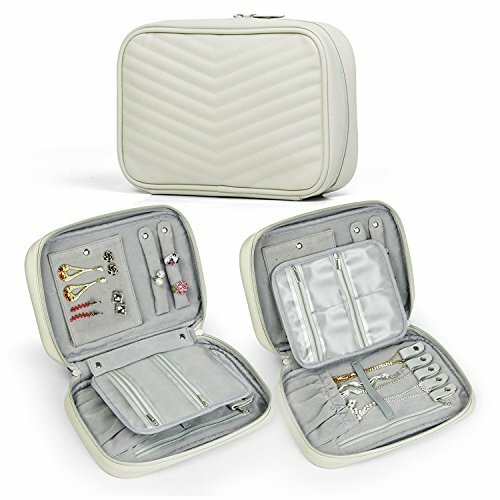 Enjoy your life with the convenience brought by Becko's jewelry organizer! COMPACT SIZE - Measuring 26 × 17.5 × 6cm, Becko's jewelry organizer grantees high portability, a smart look, and most importantly, multiple functions. Compact size leaves you no worry about space while on the go, helping to release more space in your suitcase. PREMIUM MATERIAL - Lined with flannelette and covered with PU leather, it not only offers a superior texture, but also helps to set you off to advantage. Makes an excellent gift for your girlfriend, daughters, wife and other female friends, or for holidays like Christmas, Valentine's Day, birthdays, and important anniversaries. UNIQUE DESIGN - It is on the whole uniquely designed as an storage bag with a two-way zipper helping to open wide, offering easy access to your jewelry as well as taking on a smart look. VERSATILE USE - Can store rings, earrings, necklaces and hair accessories. Leaves no more worries about where to place your jewelry and serves a good assistant helping to carry your jewelry along . AN IDEAL TRAVEL COMPANION - Whenever going out for parties, banquets or other business activities, you can effortlessly take this compact case along with all necessary jewelry inside. Becko's jewelry organizer guarantees you a charming look and full confidence. If you have any questions about this product by Becko, contact us by completing and submitting the form below. If you are looking for a specif part number, please include it with your message.